Yaletown got its name in the 19th century when the Canadian Pacific Railroad moved its rail yards and repair facilities from Yale, in the Fraser River canyon, to the new Yaletown on the north shore of False Creek. Yaletown Known to many as Vancouver’s little Soho, Yaletown has experienced a revival in the past several years to emerge as downtown’s trendiest residential neighbourhood for urban professionals. 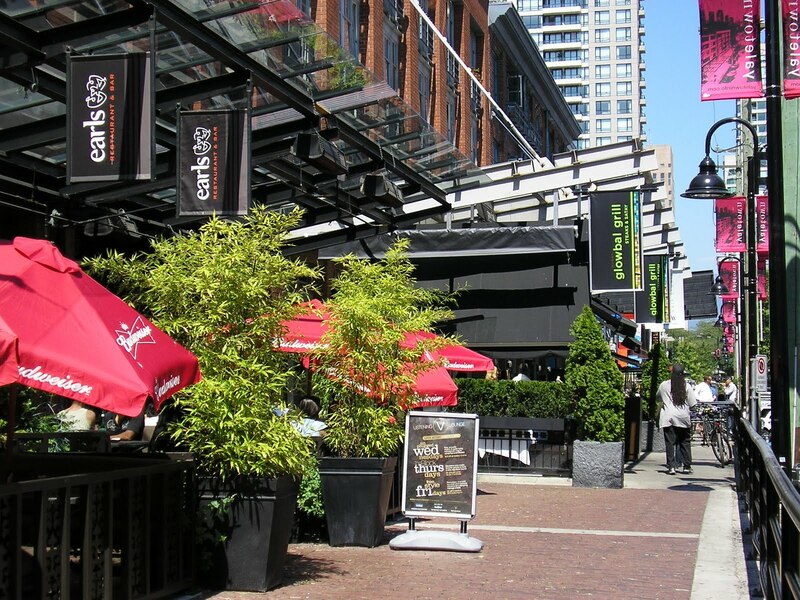 Impeccably hip, Yaletown is brimming with quality restaurants, boutiques, and galleries. It is a neighbourhood to see-and-be-seen. A seven block area bound by Nelson, Homer, and Drake Sts and Pacific Blvd. Hamilton and Homer Sts, Yaletown retains the red brick charm of its history as a 19th century rail yard. Warehouses have been converted into lofts and railway loading docks now serve as patio space for martini bars. The Roundhouse Community Centre offers a number of arts and fitness classes (604-713-1800; 181 Roundhouse Mews, cnr Davie St and Pacific Blvd). The centre also houses Engine No. 374, which brought Vancouver’s first train passengers to the city in 1887. The historical engine sits on public display and can be enjoyed street side. Choices Market Yaletown provides a range of conventional, organic and natural foods (604-633-2392; 1202 Richards Street). To find groceries of the upscale variety try Urban Fare (604-975-7550; 177 Davie Street). In addition to its eat-in café, this is the place to go for gourmet condiments and specialty items, as well as every day grocery needs. To cure that sweet tooth, try Ganache Pâtisserie, a Parisian inspired pâtisserie featuring gastronomic art (604-899-1098; 1262 Homer Street). Chocoatl Chocolatiers is a boutique and café offering sinful pleasures for chocolaholics and diabetics alike. 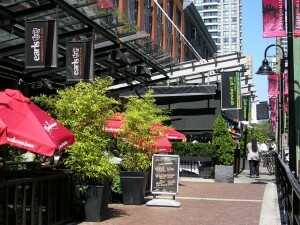 Many of Yaletown’s countless restaurants and bars can be found on Hamilton and Mainland Streets. Cioppino’s Mediterranean Grill showcases light and fresh pasta dishes in the “Cucina Naturale” tradition and boasts many awards, among them the honour of Chef of the Year for the 2008 Vancouver Magazine Restaurant Awards (604-688-7466; 1133 Hamilton Street). Bluewater Café and Raw Bar features an oyster bar, fresh sushi, and private wine cellar (604-688-8078; 1095 Hamilton Street). Discover the New York inspired Bar None Nightclub (604-684-3044; 1222 Hamilton Street). Glowbal Grill & Satay Bar offers inventive dishes, a quality wine list, and open kitchen, suitable for lunch or dinner (604-602-0835; 1071 Mainland Street). Tequila Kitchen is the place for Mexican tapas and, you guessed it, 100% agave tequila (604-681-2120; 1043 Mainland Street). Yaletown Brewing Company is an award winning microbrewery (604-681-2739; 1111 Mainland Street). The Opus Bar of Yaletown’s Opus Hotel was voted Vancouver’s most popular nightspot in Zagat 2008. Playful, stylish, and sophisticated, the Opus Bar features innovative cocktails and nightly music with local DJs (604-642-0557; 350 Davie Street). Yaletown boasts a variety of home ware shops and galleries. To find upscale but unique pastoral accessories for the home, including vintage pieces, try The Cross Décor & Design. The Cross also offers homes consultations for design services, as well as fresh florals in the spring and summer seasons (604-722-6987; #108-1118 Homer Street). For those who prefer a modern style, Designhouse features furniture, cookware, home and personal accessories (604-681-2800; 1110 Mainland Street). The Coastal Peoples Fine Arts Gallery is one of the best collections of Pacific Northwest Coast Native artwork in Vancouver (604-685-9298; 1024 Mainland Street). Fashion, gifts, and jewelery can be found in retail locations throughout the neighbourhood. Atomic Model Boutique offers to-the-minute fashion for those who dig runway designs as well as denim (604-688-9989; 1036 Mainland Street). Eden is a high-end boutique with a vintage Victorian feel, featuring an array of fashion from the US, UK, and Europe (604-685-1737; #104-1042 Hamilton Street). Vasanji has a versatile collection of Euro and Canadian clothing and accessories for men and women alike. Bionic Footwear offers Lacoste, Miss Sixty, and Camper labels, among others (604-685-9696; 1072 Mainland Street). Era Custom Design Modern & Vintage Jewellery is a refreshingly intimate boutique showcasing the work of jewelery designer Rosemary Bartram, as well as handpicked vintage pieces (604-688-2714; 1266 Homer Street). For lace and ribbons, try Gateau Lingerie, which stocks such diverse lines as Elle Macpherson Intimates, Anna Sui, Betsey Johnson, and Ed Hardy Intimates (604-676-0785; #115-1058 Mainland Street). Yaletown is also home to quite a number of canine residents. Those looking to pick up trendy accessories for their companion should try The Dog and Hydrant, which also offers pet photography as well as canine adoption services assisted by the Vancouver Animal Shelter (604-633-3845; 1145 Pacific Boulevard). Parkades and Meter Parking are available in various locations.